It's About TV: James Garner, R.I.P. 2. As an adjunct to #1, he was married to the same woman since 1956. Put that in your pipe and smoke it! 4. Speaking of The Rockford Files, I watched the show regularly when it was on in first-run, primarily because, living in the world’s worst town, NBC was the only network we could get. I always had fond memories of it, but when I watched it years later, I found it dated. I couldn’t get past the big cars, bad clothes, overteased women, and constant smoking. A couple of months ago, I revisited Rockford while I had the flu – I was a captive audience, so to speak. And I came to the conclusion that it was Garner who kept Rockford from being dated. His acting style – well, was it really a style? He was so natural, so effortless, the way he played not only Garner, but most roles. He had an easy self-confidence that was probably the result of a lot of hard work, but still. The ability to project yourself that way can only be called a gift. 5. I’d also compare him to Paul Newman in the sense that Garner was an actor who could give gravitas even to projects that didn’t deserve it. Excepting Space Cowboys, of course. 6. And, as Teachout notes, didn’t Garner steal the show from Newman, et. al in Twilight? You probably didn’t see that – it was one of those rare movies, a drama for grown-ups that didn’t rely on special effects, comic book tie-ins, loud music, car chases, and the like. 7. Garner was really something behind the wheel, wasn’t he? I mean, he, Newman, and Steve McQueen could have started their own race team. They would have won a few, too. Don’t know about the clash of egos, though. Not to mention team orders. 8. He wasn’t perfect, though. I recall years ago when he starred as a U.S. Senator in Space, the disappointing miniseries of James Michener’s equally disappointing novel. In the book, Garner’s character had been a Republican, but Garner insisted on changing him to a Democrat for the series. The character wasn’t that political, but Garner was a big-time Democrat, and perhaps he just didn’t have the acting chops to put himself into the role of a Republican. That’s one thing I’ve always admired about Martin Sheen, by the way – I’ve seen him play a Republican before, and he did it with as much conviction and acting integrity as he did later on in The West Wing. 9. A last word about Maverick – it wasn’t originally intended to be a light-hearted Western spoof, but according to Brooks and Marsh in their Complete Directory, the change happened early in the series’ run, when a bored scriptwriter (later ID’d as Marion Hargrove) added a stage direction referring to Maverick looking at someone “with his beady little eyes.” Garner thought the direction hilarious, and played the scene for laughs. The rest is history. 10. 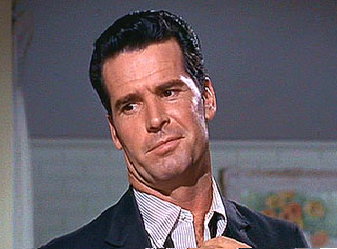 We shouldn’t mourn James Garner too much. His life was full, his days as an actor were principally behind him, and he left a great body of work that will continue to please audiences for a long time. We may miss the fact that we won’t be able to turn on the TV and see an interview with him, or read another volume of memoirs, or see him in a cameo appearance – but he’s given us more than enough pleasure to make up for it. 11. If you want to read more, The Guardian – typical of Brit newspapers – has a wonderful write-up here. To your excellent tribute I would only add a mention of his Polaroid commercials with Mariette Hartley. They were not artistic achievements on par with Maverick or Rockford (or Nichols, for that matter) but they spoke volumes about his genuine likability as a public figure. Absolutely, David. Those commercials are so much better than what's on today - testament he (and Mariette Hartley, as well) connected with the audience. Remember how people used to think they might have been married in real life? Now that's talent! I was amazed that so many of the media's obits for James Garner failed to mention he was a U.S. Veteran of the Korean War and received the Purple Heart for being wounded in action. As an actor I truly enjoyed Mr. Garner's work but the Rockford Files was the best for me. He was fantastic for the role or better yet.... the role was fantastic for him. Hi Bill - you're absolutely right. I'd read about his service in one of the obits, and neglected to mention it myself. His distinguished service was all part and parcel of the man, don't you think? The complete man, as it were. And I'm proud to link to your great site!